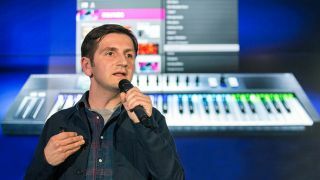 NI's Mate Galic announces the Komplete Kontrol upgrades at Musikmesse. MUSIKMESSE 2015: Native Instruments has announced a raft of upgrades for its Komplete Kontrol series keyboards, the most notable being the development of the Native Kontrol Standard (NKS), a new format that enables third-party plugin developers to integrate their products with NI's hardware. Promising to "go beyond the limitations of current formats," NKS will enable plugin developers to integrate their instruments to the same level as Komplete ones, meaning that they'll be available to take advantage of features such as the Light Guide. There will also be straightforward VST support. NI says that it's already working with major software instrument developers and the wider development community "to ensure that the leading software instruments use NKS to provide the deepest integration possible with the Komplete Kontrol system." It's set to be implemented in the summer. Another announcement was that of Komplete Select, a new 'premium selection' of Komplete 10 instruments and effects that will now ship with all Komplete Kontrol keyboards and be made available to existing owners. This includes Massive, Prism, Scarbee Mark I, Solid Bus Comp, Drumlab, The Gentleman, Vintage Organs, Monark, Retro Machines and West Africa. Registered owners of NI's Maschine will also receive Komplete Select as a free download when it's released in May. Finally, the Komplete Kontrol software has been updated to version 1.1. This offers "numerous" improvements, including the ability to route and record MIDI sequences created with Komplete Kontrol's Smart Play functions freely within a DAW environment, and to send MIDI to outboard gear. There's also an improved preset management system and enhanced Touch Kontrol functionality. Komplete Kontrol 1.1 is a free update that will be available in May from the Native Instruments Service Center. You can find out more about all of these updates on the Native Instruments website. NI has also confirmed that there'll be a new edition to the S-Series keyboard portfolio at some point this year - more news on that as we get it.